One of these doctors is Michael Forbes. He is a pediatric critical care intensivist and the director of critical care research at Akron Children’s Hospital. He believes in miracles. But he also believes in research. 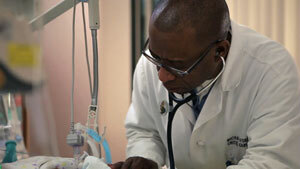 In fact, he’s leading a national study on how to reduce hospital infection rates. Akron Children’s pediatric ICU is involved in a multitude of national and local studies to improve quality of care – defined as safe, timely, effective, efficient and family-centered. The research Dr. Forbes and Akron Children’s pediatric ICU team performs not only benefits the more than 1,100 patients seen here each year, but also helps improve pediatric intensive care across the country.